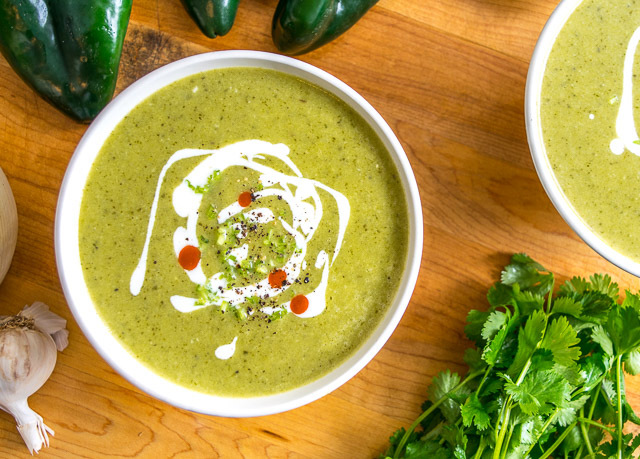 This Roasted Poblano Soup is proof that poblano peppers are introverts. They don’t do so well in groups and seem to prefer hanging out with one or two good friends. And in this case, it’s a final dash of acidity that gets the call. That’s all you need here to make the poblanos thrive, so don’t worry about loading up the soup itself with lots of other ingredients. Our Mexican Cooking Survival Guide is only for people who are tired of greasy taco joints. All others please carry on as if you did not read this. Not pictured is the smell of roasted poblanos wafting through your house. But trust me, it’s included with this recipe and it has the ability to instantly change your mood. So that’s about 25 minutes total in the oven. I used to put these in a bag and let them steam up so the skin comes off easier, but not anymore. Most of the skin will come off as is and I’ve found that it doesn’t matter too much if you leave some of the skin behind. 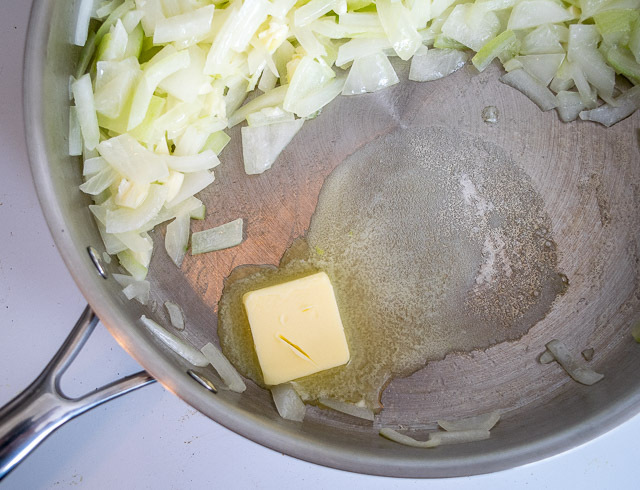 Meanwhile, get a chopped onion sweating in 3 Tablespoons of butter for 5-7 minutes. Add 3 cloves of minced garlic and saute for 1-2 minutes. To thicken up the soup, we’ll add 3 Tablespoons of flour and mix well. Yes, the flour will stick to the onion a bit, but in the end it doesn’t seem to matter too much. A more traditional option would be to clear some space in the pan, add a bit more butter, and then whisk the flour directly into the butter (Thanks Chloe for this tip!). This would probably get you a higher grade at culinary school, but I’ve tried both options and didn’t notice much of a difference in the final product, i.e. the easy option wins. Add 4 cups of stock, 1/2 teaspoon of salt, and some freshly cracked pepper. Once you’ve pulled as much skin off the peppers as you can, de-stem and de-seed them. Roughly chop the poblanos and add them to the saucepan. Simmer to bring everything to a uniform temp and then combine in a blender (or use an immersion blender). Return soup to the saucepan and taste for salt. I used a batch of zero-sodium homemade stock so I added another 1/4 teaspoon of salt at this point. If you are using storebought stock you might not need any additional salt. In other words, these poblanos need a good friend to hang out with. It’s amazing what a hint of acidity does to this soup. I’m using a few drops of Valentina hot sauce, but vinegar or lemon/lime juice would have a similar effect. The acidity brightens up the flavor and makes everything pop. So good! I’m also using Crema, freshly cracked black pepper, and finely chopped cilantro stems. I also wanted to mention that I’ve tried this recipe with the cream mixed into the soup and found that it dulled the flavor of the poblanos too much. No bueno. But garnishing with cream and snagging a bit of it for each bite works wonders. That means that once you make your way through the top garnish, you have full permission to add another layer. Think of it as looking out for the well-being of the poblanos. Everyone needs a bestie right? 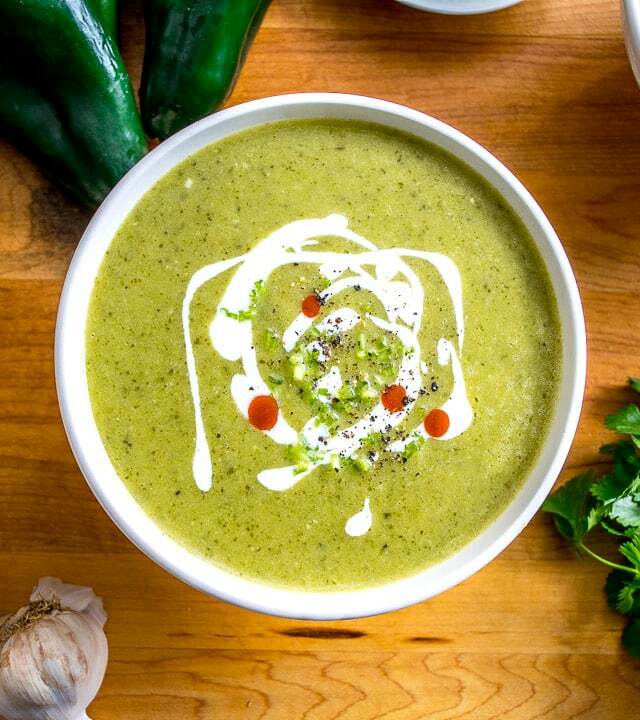 The key to this Roasted Poblano Soup is getting creative with the garnish. 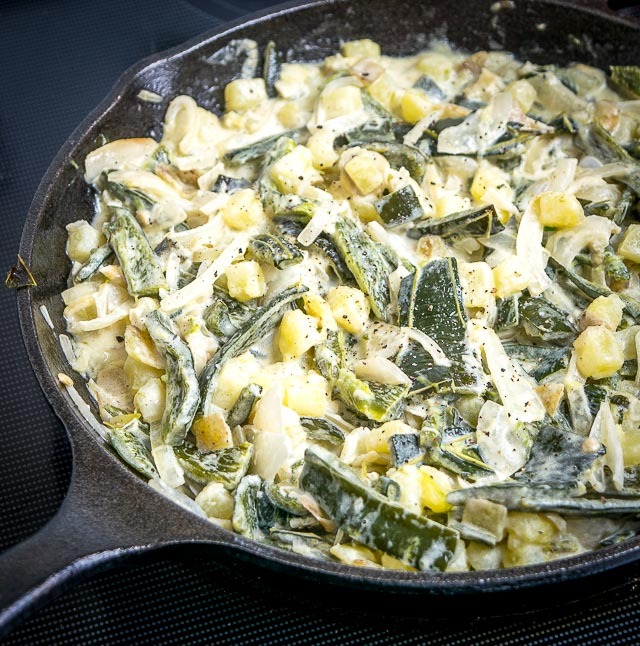 Crema, cilantro stems, and a dash of acidity will turn it into something otherworldly. So good! Rinse the poblanos and roast on a baking tray at 400F. Give them a flip after 15 minutes. They'll be mostly roasted in another 10-15 minutes, so 25-30 minutes total roasting time in the oven. 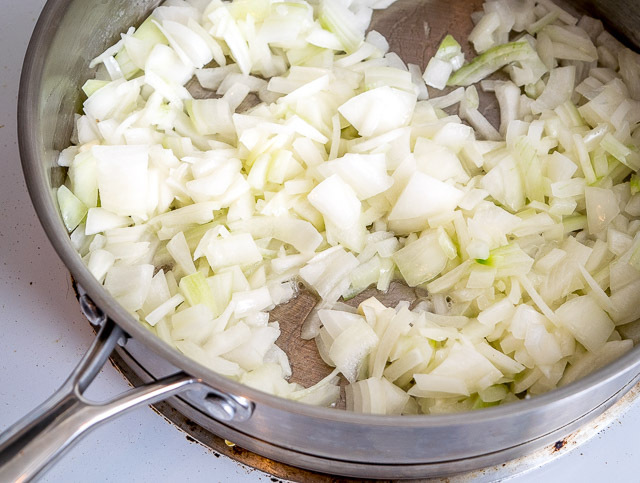 Add 3 Tablespoons flour to the onion mixture and mix well. Add 4 cups of stock along with 1/2 teaspoon salt and freshly cracked pepper. Stir well. Bring to a simmer and cook for 8-10 minutes. 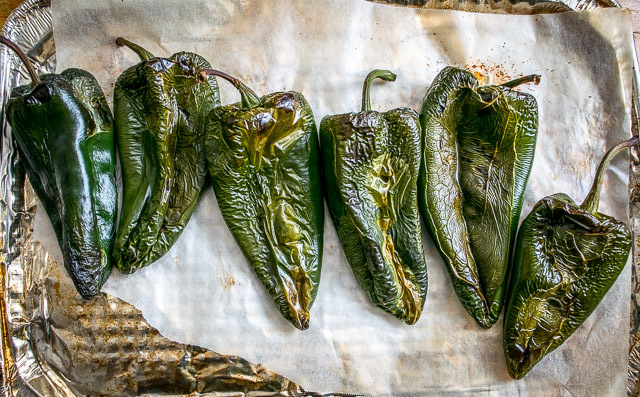 Once the poblano peppers have cooled a bit, pull off as much skin as you can. Then de-stem and de-seed the poblanos. Roughly chop the poblanos and add them to the saucepan. Cook until everything is at a uniform temp and then combine the mixture in a blender (use caution when blending hot liquids). Return mixture to the saucepan and simmer for 5-10 minutes. Salt to taste. I added another 1/4 teaspoon of salt. Serve immediately but don't forget to garnish! I used Crema, finely chopped cilantro stems, freshly ground pepper, and a couple dashes of Valentina hot sauce. The acidity of the hot sauce pairs well with the poblanos so feel free to re-garnish once you make your way through the top layer. I used homemade stock with this recipe. Storebought stock typically has a higher sodium level so adjust accordingly. Poblano size varies. I would suggest using 3-4 if they are larger, and 5-6 if they are smaller. I used Valentina hot sauce to add a hint of acidity but there are lots of options for this: lemon/lime juice, vinegars, or your choice of hot sauce. I tried this recipe with cream mixed into the soup but didn't like it as much. I preferred it when the cream was used as a garnish. Got leftover Poblanos? Make some Rajas! 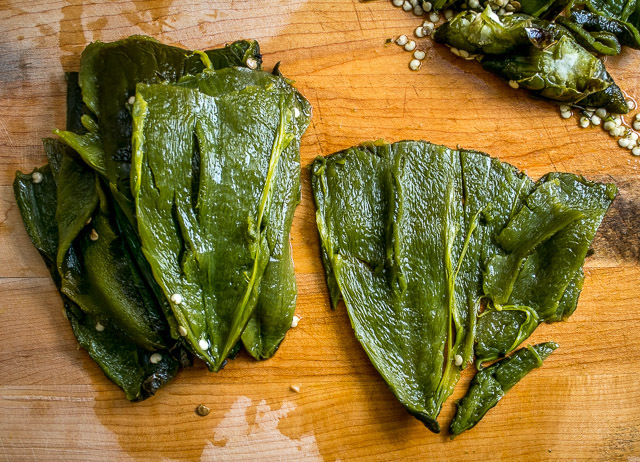 Or check out these Poblano Pepper Recipes. 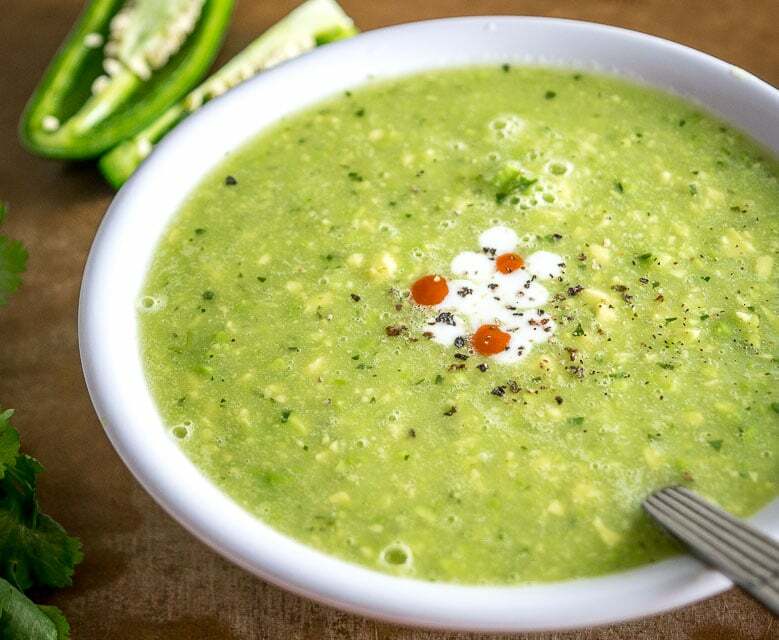 Our latest post is this delicious Avocado Soup. This looks delicious. 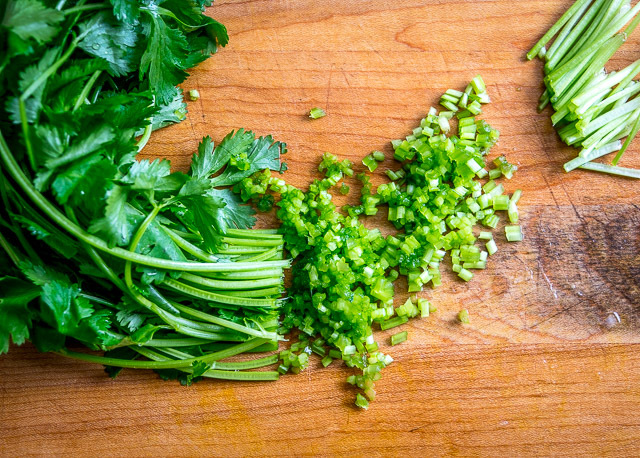 I always think of cilantro stems as an ingredient to build the flavor, but never as a garnish. What have I been doing all these years? I made this today and it was really good my boyfriend loved it thank you ? We just came from a cruise that served a soup similar to this.Theirs also featured roasted corn kernels so I’ll add a minimal amount to the soup. Thanks for a delectable recipe. Awesome, thanks for letting me know Zanetta! Yup hard to go wrong adding some corn to this recipe. Enjoy! Yum! I am going to make this over the weekend! Hope I can wait!!! Awesome Terrie, you will love it! This says serve immediately. Most soups are so much better the next day. Is this recipe good to make a day ahead then add the garnish at serving? Hi Michelle! Yup this will keep in the fridge for at least a few days if not longer. And your idea to garnish at serving is perfect as I’ve found that the garnish can add so much to this soup. Cheers. Finally had a chance to make this and it did not disappoint. Flavorful, spicy, creamy. Perfect! I had poblamo cream soup when in Scottsdale, AZ, last week & immediately looked up recipes. The advice on the number of peppers was correct, but I just had to add that 5th large one! To compensate, I whisked in some mashed potatoes. 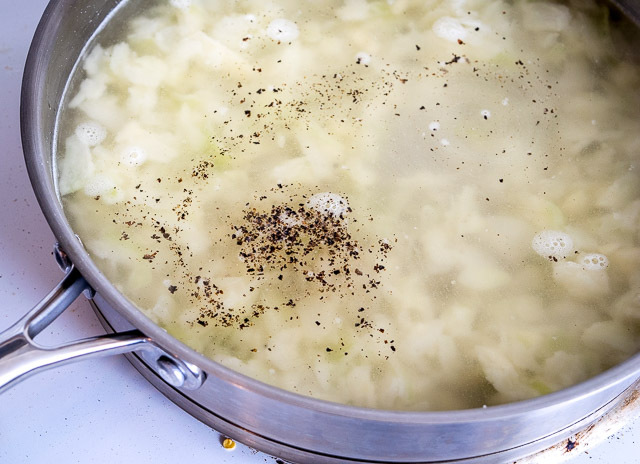 This was a good quick fix – it thickens the soup, but doesn’t compromise the flavor. Delicious! Thanks for your note Anne! Yowsa adding in some mashers is a great addition, would like to try that — and good to know it doesn’t dilute the flavor too much as that would be my main concern. Just finished cooking this. That roasted poblano aroma is making my house smell incredible. The taste is superb, and I love the little kick the poblanos provide. I had always thought poblanos had no heat at all. Thanks for the feedback David! Yeah I remember being surprised at the heat when I was fiddling with the recipe — I crave that heat now as I like this soup best when it’s just on the threshold of too spicy. I think it must be from the sheer volume of the poblanos as they are big and there are lots of them in the recipe! I’m glad you found a keeper recipe. Cheers. Thanks Donna! 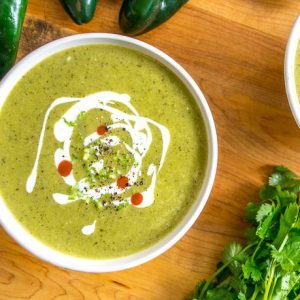 I’m a huge fan of this poblano soup so I think you will love it. Hope this helps a bit. Let me know if you have any other questions. Cheers. Cotija cheese That is great to know! I never heard of it but that is my kind of cheese! I’ll be looking for it. Thank you bunches. Yeah I am a Cotija convert and always keep some in the fridge — some chain supermarkets will carry it but if not there you can always find it at Hispanic markets. I also made this soup and added fresh corn the flavor is superb and my husband ate so much for lunch that I’m not sure we have enough leftovers for dinner, which was my intention, oh well. Thank you for posting such great recipes, I really enjoy trying them and reading about them! Oh great thanks for the feedback Terry! I’m a huge fan of this poblano soup and some fresh corn is the perfect addition to it. Cheers. Can I substitute pasilla peppers for the poblano? In the States grocers will frequently mislabel Poblano peppers as Pasilla peppers. I don’t think anyone really knows how this started but I see it quite frequently and it is massively confusing for peeps. 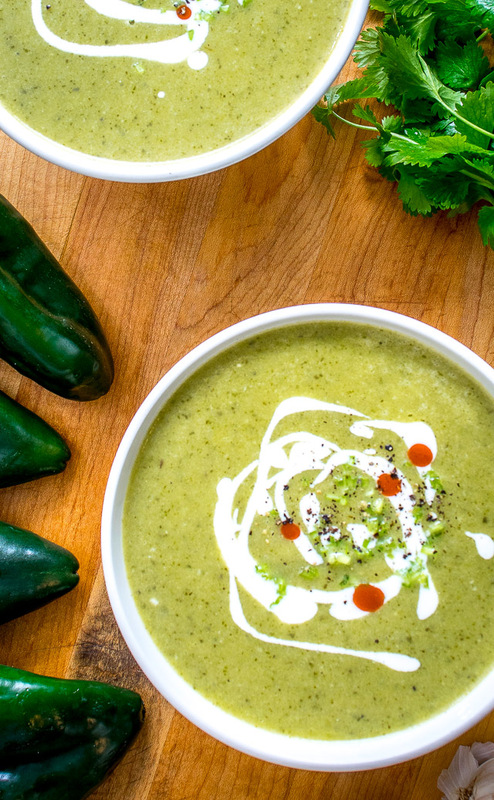 A Pasilla is a dried Chilaca chili and would not be a good fit for this Poblano Soup recipe. But if the “Pasilla” peppers in your grocery store look like the Poblano peppers in this recipe then most likely they are officially Poblanos and you can definitely use those in this recipe. Hope that helps a bit — let me know if you have any other questions. Cheers. 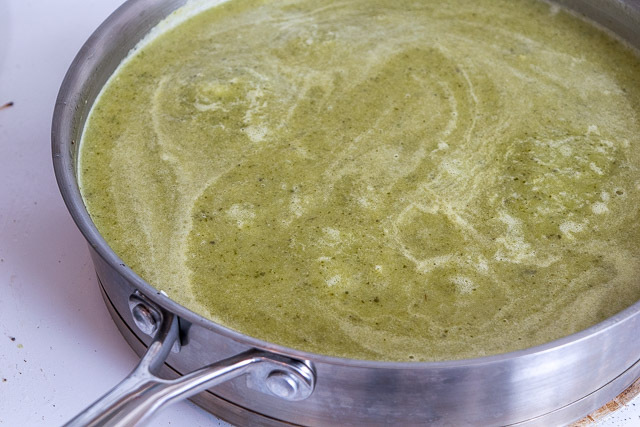 In the poblano soup recipe, which kind of stock are you referring to….chicken, beef, etc.?? Hi Patricia, I typically use chicken stock but veggie stock is a good alternative if you want to make a vegetarian version. Cheers. My backyard garden is starting to produce peppers en masse. I tried this recipe with a combo of two poblanos, three Havasu, five Cajun belles, and one jalapenos pepper. Also, only had homemade ham stock on hand, so used that as well. It’s got a little heat to it, but that’s fine by me. All in all, it was a success! Will definitely try this one again with different pepper mixtures. Wow awesome JP, would love to try this soup with a combo like that, thanks much for the inspiration! I added a bit of garlic powder in addition to the fresh garlic and a little bit of smoked paprica.I added a big dollop of plain whole yogurt on top. Awesome Jean! Some great adjustments — now craving it! Hi. Love this recipe and tried it as well. Instead of flour I used cream as I had more poblanoes (8). Wondering if. Can de-stem and de- seed before roasting? Seems it may be easier and less messier. Not sure though how much taste would be impacted? Has anyone tried it this way? Hi Naina thanks much for the feedback! Yup you should be able to de-stem and de-seed before roasting and it shouldn’t impact the flavor much at all. 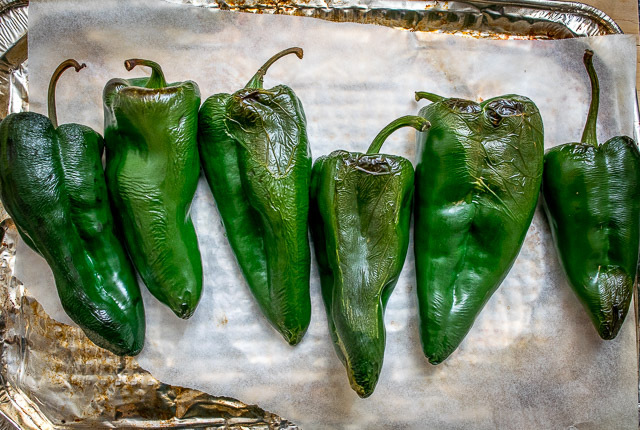 Of course, that’s assuming you are using the oven to roast the poblanos. Old school poblano roasting is done over an open flame and when doing it that way it’s convenient to have the stem attached. Cheers. I have Hatch Chilies. I think I’ll try it with those. Have you ever frozen this soup? I want to make a big batch and freeze it in smaller containers for convenient meals, but I don’t want to destroy the texture or flavor. Hi Skye! I’ve never frozen this soup before so I can’t give a firsthand account. It has tremendous zip and vitality when freshly made and while you will probably lose a bit of that zip when freezing it, I think it’s still going to have pretty good flavor. I would probably freeze it without the garnishes and cream and save those for when it’s served. Hope that helps a bit. Cheers. Made this today. It is tasty, but mine is super spicy! My tongue is on fire, even with topping with sour cream. Maybe my poblanos are just extra hot? Hi Yara! It’s definitely supposed to be a little spicy but it sounds like you might have some fiery poblanos on your hands. Can I ask how many you used? If it comes out too spicy for your palate you can always dilute it down a bit by adding more stock, but normally you shouldn’t have to do that. It’s also worth keeping in mind that poblano size can vary quite a bit so if using larger poblanos you can typically use less of them and get a similar result. Okay, let me know how it goes, I think it’s worth trying it again and tweaking it for your palate if necessary — it’s such a great dish to have in your arsenal and I come back to it on a regular basis. 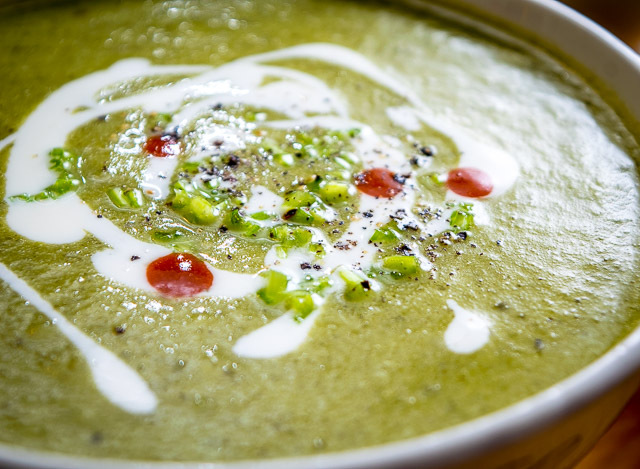 Made this Roasted Poblano Soup last night…..It was amazing!!!! I used 6 polanos and Tapatio hot sauce… I will definitely be making this one again! Thank You! Thanks Pamela so glad it was a hit! Made this today. I used 6 poblanos and added smoked paprika and some cumin. It’s so delicious! Thanks for the inspiration. Hmmm sounds delish, now craving it!